Test to see if clipPathUnits attribute is handled properly on a clipPath element. 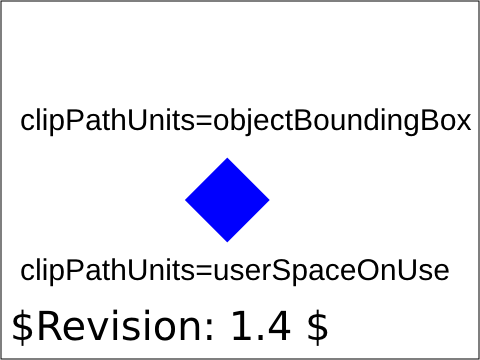 Only tests the userSpaceOnUse and objectBoundingBox items of the clipPathUnits. userSpace has been tested by the previous test as it is the default. The test at the top shows a red rectangle that has been clipped by a rectangular clipping path. The clipping path is defined using clipPathUnits=objectBoundingBox. 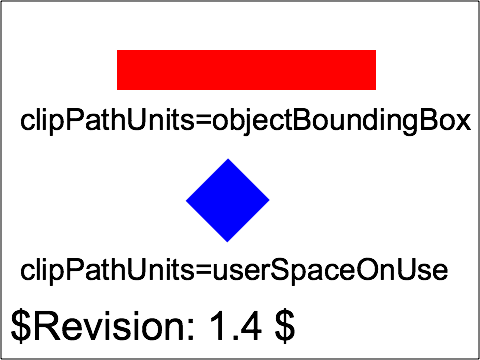 Only the bottom-right portion of the red rectangle should be visible. The example at the bottom a rotated blue rectangle that has been clipped by a rectangular clipping path. The clipping path is defined using clipPathUnits=userSpaceOnUse. As a result only the bottom-right portion of the rectangle should be visible.